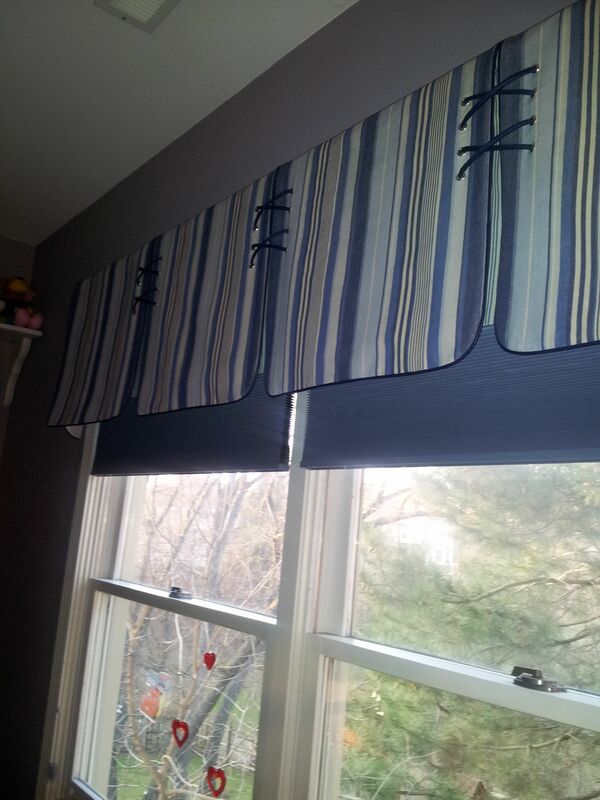 Valances: they can be a solution to many decorating dilemmas! Sometimes blinds were selected for a functional reason (privacy, and light control) and the hardware of those blinds are unsightly. A valance will be ideal in this case to cover up what needs to be covered. When rooms are too small, and full draperies are overpowering, valances can provide the warmth, texture and color to the room just as much as a pair of drapes, without overwhelming the room. If the view can not be compromised, and full draperies are obstructive, a well designed valance will give maximum exposure, without taking away the beautiful view. When there is a need for natural light in rooms for a special function, such as craft or sewing rooms, sun rooms and kitchens, valences liven the windows without blocking the sunlight. If the window is by an area where draperies can be easily soiled like over a sink window in the kitchen, or in a bath room by the jacuzzi, having a valance to dress those windows up is much more practical than draperies that drop down. When having two windows on one wall with different sizes, designing valances to help unify the look is a smart idea.